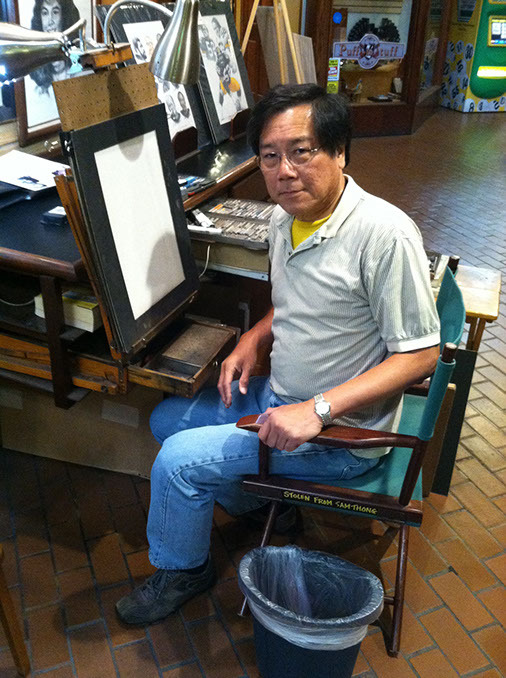 Sam Thong, the famous caricature and portrait artist at Station Square, started out at West Virginia University majoring in graphic art and business. When he first came to the United States from Thailand at the age of 17, he never planned on making a career out of drawing faces. After his graduation Sam continued drawing, the artist yet to find anything he loves more. From animals to people and buildings, Sam is an artist who can create any request handed to him. Visitors traveling to Station Square can bring in their own photographs, now you can email or text the photographs, Sam is able to take the images and draw a near life-like portrait. His art work extends far beyond the walls of Station Square as he can be requested to attend private parties, wedding, birthday, bar or bat mitzvah and draw caricatures of the guests attending. Sam enjoys nothing more than bringing smiles to the faces of his customers, so come and visit him with your family and friends at his easel across from Buckhead Saloon at The Shop at Station Square.